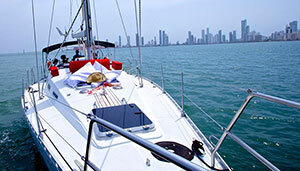 Hit the open water in a Cartagena with economy yacht rental. The compact vessel offers a timeless feel, versatile furnishings, and a relaxing atmosphere for a leisurely experience. The affordable vessel is equipped with all of the amenities to make your vacation cool and comfortable, from the wrap-around dining area to the top deck sunning station. This vessel tranquility and coziness make it the ideal one for socializing and entertaining with family and friends, or time alone at sea. On the top deck of the Cartagena economy yacht, you’ll be met with a sitting area complete with two rows of bench seating, comfy cushions, and pillows. In the center you’ll find a table to hold beverages, sunglasses, and other items. The top deck also allows plenty of room for laying out and soaking in the sun. Head to the front of the vessel to find a set of steps that gently lead you down into the water. Spend your day alternating between sun and swim. Feeling ravenous? Just inside the boat is a compact kitchen and dining area with everything you need for a good time on the open water. Sit at the oval dining area surrounded by cushioned bench-style seating for a delicious meal or a few chilled beverages. There is plenty of storage space to keep your possessions, as well as counter space to prepare meals. Windows surround the perimeter of the kitchen/dining area, allowing sunshine to flow in and you to peer out at the water. When you feel fatigued, just head indoors for a quick nap in the yacht’s comfortable bedroom. Featuring two bunk-bed style beds, It is the perfect place to get some shut-eye at the end of a long day of boating. The bedroom also features a sink where you can wash up before bed. Cozy, versatile, and affordable, the cheap rentals is the ultimate vessel to host your next getaway.